New improved breathable van cover by using the latest materials available on the market. Made with 3 layers of highly water resistant and breathable polypropylene non woven fabric. 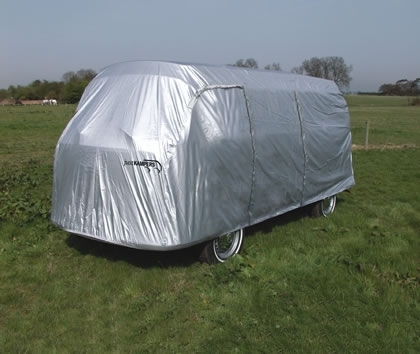 This material is designed to have good ventilation to release trapped in moisture and heat, and to help protect your van against the sun's UV rays. It has a full length under vehicle securing strap and rain flaps on all the zips. It is designed to fit Splits, and Bays and will also fit over pop tops (excluding fixed high tops). It has an all round elasticated hem, with three under vehicle adjustable securing straps (one lengthways and two widthways) and four door openings to allow for both front doors and either LHD or RHD sliding doors to be opened. The door zips have rain flaps to provide extra protection, all door openings have ties to help you air your vehicle in winter storage.